Our chart and guide on humidifiers needed a complete overhaul, which included replacing a few existing recommendations. We added some excellent humidifiers including the TaoTronics Top Fill Humidifier and the advanced Oasis OH-1 soundhole humidifier, while D’Addario feature with their Humidipak Two-Way Humidification System. Here’s a question – has your solid-wood acoustic guitar ever sounded amazing one day, then awful the next? Unless you lost your ability overnight or are playing drunk, chances are the cause of the bad tone is down to humidity issues. But Isn’t a Dry Environment Great for a Guitar’s Tone? Are Humidifiers Only for Acoustic Guitars? How Much to Spend on a Guitar Humidifier? Depending on where you live, humidity can be anything from a minor to major issue for guitarists with a solid-wood (or part solid-wood) guitar – ranging from poor tone to irreversible damage. The reason being that wood is very susceptible to moisture and temperature changes. While guitars are made in regulated environments where humidity is kept at a constant, the moment they leave the factory or workshop, it’s up to both guitar stores and individual owners to ensure the guitar is stored in the right environment. Of course, that’s where humidifiers come into the picture. These devices regulate the humidity in and around your guitar, ensuring optimum storage wherever you live. In fact, having a humidifier is almost as important as having a decent cable or a good tuner. We have searched the market for the best humidifiers out there and highlighted our favorites in the chart below. Then stick around for a guide on buying a humidifier and how to keep your guitar in the best condition. Packed with features, this is an awesome room humidifier. Another excellent room humidifier with an auto-humidistat. An affordable humidifier that’s great for smaller rooms. A clever two-way system to keep humidity at the right level. Good value for this reusable case humidifier. A solid soundhole humidifier with no need for regular refills. 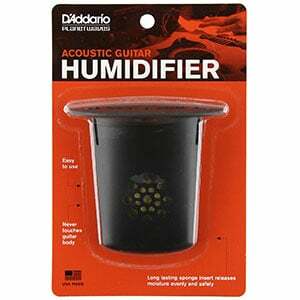 One of the most popular soundhole humidifiers on the market. An easy-to-use budget option that works well! 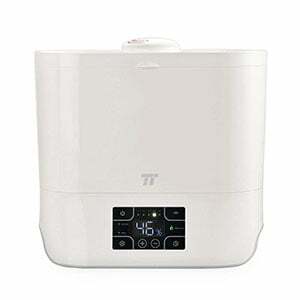 Kicking off this list is a great room humidifier from TaoTronics, coming in at under one hundred bucks. Although a little pricier than some of the other humidifiers on this chart, there are plenty of features that make it excellent for both guitarists and general home users. With a 4-liter tank and stylish all-white design, highlights of this model include the option of presetting the humidity, which is key for guitarists wanting to hit the ideal 45 to 55 percent humidity levels. It also includes a sleep mode, ceramic filter, and five mist levels. While there are many decent room humidifiers out there, the stylish Proaller Cool Mist Ultrasonic humidifier offers some great features that make it a solid choice for guitarists, as well as the general user. For under $50, this 6-liter humidifier features an auto humidistat allowing you to set the room humidity levels to 45 to 55 percent, and then forget about it (especially as it is so quiet). Other key features include a timer, three different mist settings, two-stage filtration and auto shut-off. A good purchase at an affordable price! Another very popular room humidifier that comes in at under $50 is the Cool Mist Humdifier from Ultrasonic. While cheaper than the two above, this 28” tall easy-to-use model still includes some excellent features that make it perfect for a bedroom or living room. These include a 3-liter tank, an adjustable mist level, a controllable nozzle (allowing you to choose which direction the mist is sprayed), and automatic shutdown when the tank is empty. With silent operation, this is also a great model to use during the night – especially with the included night light. If there is one thing that guitarists like, it’s when the guesswork is removed from guitar maintenance. This is probably why the Humidipak case humidifier from D’Addario proves so popular, as it takes the manual adjustments and humidity measuring out of the equation. This two-way humidifier promises to keep humidity inside a guitar case at a constant 45 to 50 percent – ideal conditions. For under twenty bucks you receive three mess-free pouches that can be popped into your guitar case and soundhole and basically forgotten about (although they will need replacing every few months). The guys at Arion offer up a simple and solid in-case humidifier, which is very efficient at keeping the inside of any guitar case well humidified. This clear tube features ‘space age technology’ in the form of a hydrogel, while the special plastic casing allows moisture to gradually escape (but, thankfully, keeps drips and mess at bay). Once filled with tap water, this humidifier should last a couple of months. Considering that you can reuse this device over and over again, the value at under twenty bucks is pretty good. Although the most expensive soundhole humidifier in our chart, the Oasis OH-1 is undoubtedly one of the best around. Sitting in between the strings – and therefore never touching the precious finish – this reliable humidifier features a special gel that holds up to 500 times its own weight in water, meaning regular refilling isn’t necessary. The design features a fabric that allows only water vapor to pass through, meaning no drips or mess inside the guitar. Another plus is that, unlike others, it is easy to see when the gel needs replenishing with water. While there are cheaper soundhole humidifiers, the MN300 from Music Nomad is a popular choice and well worth the small price. In a sleek blue and black plastic shell sits a ‘Humid-i-Bar’ sponge, made from a no-drip material that innovatively holds up to ten times its weight in water. The advanced sponge (accessible via a convenient flip lid) means you shouldn’t need to remoisten it more than once a week. This simple device neatly slips between the strings and hangs in your guitar’s soundhole, meaning no contact with the wood is required. Cheap and cheerful, this acoustic guitar soundhole humidifier from D’Addario’s Planet Waves is incredibly easy to use and comes in at just over five bucks. Using a popular plastic shell design, this humidifier is designed to be placed between the two middle strings where it rests into the guitar (never actually touching the body) and slowly releases moisture. Inside, it features a sponge with a non-drip design, with replacement sponges available at an equally affordable price. Simply moisten the sponge when it becomes dry and you are good to go! A sensible budget option. Humidity can’t be that bad… right? Wrong! While light or occasional humidity issues are unlikely to bring anything more than minor damage, if you don’t control heavy or persistent humidity issues, irreversible major damage can occur. Many of us live in states and cities where conditions are particularly dry. Air conditioning is essential in the summer months, then when the temperature drops, we turn on heaters and radiators which dry the air out even more. Unfortunately, when humidity drops to under around 30 percent for long enough, you may begin to see damage to your guitar. This damage can include sharp fret edges, warped necks, loose bridges and neck joints, separating glue, and severely reduced playability, while you may hear drastically poorer tone and fret buzz. Let humidity drop to under 15 percent and you may start to see cracks develop along the body, bridge and fretboard as the guitar dries out. It is literally like watching the guitar die in front of you – and it’s tragic. This is irreversible damage or only something a pro can restore for a hefty fee. Considering that you can buy a decent humidifier for as low as $5, it makes sense to explore that option instead of unnecessarily exposing your prize axe to such potential damage. Some guitarists believe a dry environment will enhance a guitar’s tone, but it is not true. While it is true that natural aging causes cell crystallization and hardening of the wood – which does result in a louder and more dynamic sound – this has nothing to do with dryness, which will only cause damage and require structural repairs in the long run. While you can try to guess the humidity of a room, an easier – and more accurate – method is to use a hygrometer or thermometer to measure the relative humidity and temperature surrounding your guitar. Basic devices costing very little are available, such as the Inkbird Digital Thermometer and Hygrometer, which will passively monitor your room or guitar case, measuring humidity with a good degree of accuracy. Then come more advanced options such as the D’Addario Humiditrak, which sits in your guitar case and sends notifications to your smartphone (via Bluetooth) if the guitar is in a hazardous humidity. So, now we have covered the basics and seen some of the most popular humidifiers on the market, let’s take a closer look at the three main types of humidifier and determine which will suit you best. As the name suggests, these humidifiers sit in or around your guitar’s soundhole – either covering the soundhole completely or sitting in between your strings, with the device hanging down into the guitar. Due to the low price and easy operation, soundhole humidifiers tend to be the most popular. However, they will only work if your guitar is stored in a case. Again, the name says it all – these humidifiers sit in your guitar case and keep the entire case regulated. They usually take the form of either a material or plastic tube which allows water vapor to pass through, or a pouch which does pretty much the same thing. As with soundhole models, these humidifiers will only work if the guitar spends the most of the time in its case. If you prefer to keep your guitars displayed out of their cases – resting on a stand or hanging on the wall – a room humidifier will be your best option as they keep the entire room regulated. The bonus of this is that, in addition to keeping your guitar healthy, a room with more than 30 percent humidity may be better for your health too. Of course, due to the electrical components, these humidifiers tend to be more expensive than the other options. In short, no. Of course, acoustic guitars tend to be associated with humidity issues because they are more fragile and rely heavily on the condition of the wood for their tone and volume. While electric guitars rely more on pickups and amplifiers, both electric and bass guitars are made of wood and are still prone to cracking, so would benefit from optimum humidity levels (generally between 40 and 60 percent). Now you know why a humidifier is important and what the different styles can offer, let’s look at a few tips on how to use them correctly, maximize their efficiency and generally keep your guitar in tiptop condition. Never leave a humidifier in direct contact with the instrument – either suspend it from the strings or place it in the case where it isn’t touching the wood. Keep track of humidity in both the room and the guitar case. Cases tend to show different humidity readings as they are isolated systems – especially hardshell models. So, when you check the room, check the case too. Complementing a case or soundhole humidifier with a room humidifier is an excellent way to keep your guitar in the best conditions at all time. If possible, keep your guitar in its case whenever it is not in use. When out of its case, keep your guitar away from open windows, heaters, and air conditioners. It’s also wise to keep it out of direct sunlight for prolonged periods. Try to avoid moving a guitar from cold to hot environments (and vice versa) too rapidly, as it can cause damage and minor cracks on the finish. Keep your guitar stored in a habitable place, such as a bedroom or living room. Storing a guitar in unheated areas including garages, attics, sheds and car trunks can lead to damage as temperature and humidity changes. If you have left your guitar in less-than-ideal conditions (too dry or too wet) for a while, take it to a professional for a damage assessment and a fresh setup. Before you splash any cash on a humidifier, factor in the price of a good digital hygrometer (around $20 to $30) so you can gauge the humidity of a certain room and/or case. We have highlighted two models in the section above, but be aware that some hygrometers come with built-in humidifiers, for great convenience – such as the Oasis HH Combo OH-30. Hygrometers aside, you wouldn’t need to spend much more than around $20 on a very good soundhole or guitar case humidifier, while between $40 and $80 should get you a very good room humidifier. While a humidifier may seem like a bit of a luxury purchase, it’s more essential than you may first think – reading our guide will have given you the reasons why. Thankfully, it’s pretty hard to go wrong with a humidifier. Providing you buy something with good ratings (just use our chart for inspiration) and use it correctly, you will find something that will keep your guitar in great condition for years to come.